I love they allow them to foal outside. 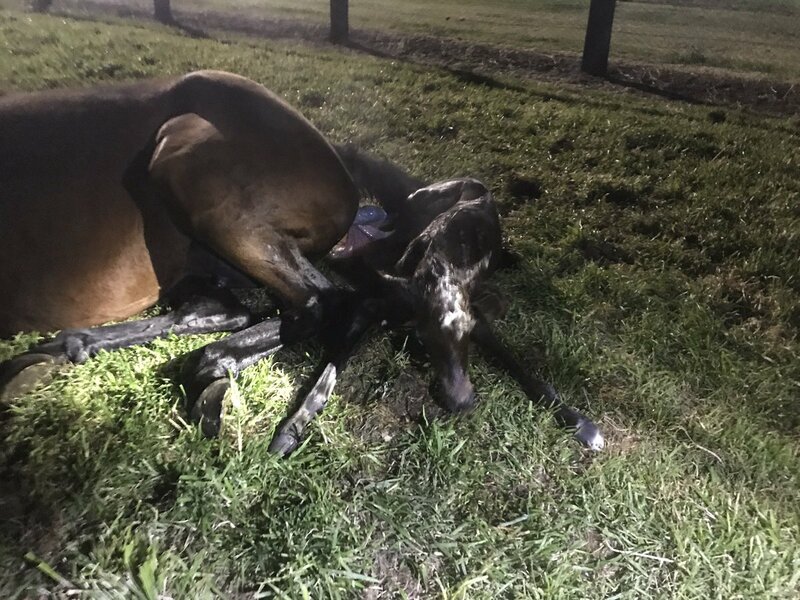 #BREAKING: Legendary mare Black Caviar has delivered a filly to champion stallion More Than Ready. Mum and daughter well. Lovely. I'm glad they sent her to More Than Ready; he's a fantastic sire. That is a very sweet photo! And that colt is a looker. Oh my heart...he is gorgeous. And those eyes! That teacup muzzle! Did an Arabian slip into the breeding shed when they weren't looking? Miss Finland (AUS) thrilled her owners by producing this Deep Impact colt 2 days ago in Australia. Does anyone have a photo of Opulence's American Pharoah colt? I do as well. Claiborne does it from what Ive seen as well as another farm in FL- cant remember the name. As long as there are no former/immediate birthing issues- its the best. Glen Hill? Most of their mares appear to foal outside in Ocala. When we rode at Adena Springs, one of their maiden mares foaled outside, right next to the fence. The foal rolled under the fence and was ~loose~ (not that it went anywhere too fast) and the mare was so surprised/shocked about this new "giving birth" concept that she hightailed away from the foal and went right to the paddock gate. Everything worked out just fine within the hour, but poor mama and baby were both very much caught by surprise! Northport wrote: Glen Hill? Most of their mares appear to foal outside in Ocala. Yep! And what a great story! Ive seen maiden mares give that "Omg, what just came out of me?!" look. 9 times out of 10- the mommy calling kicks in. 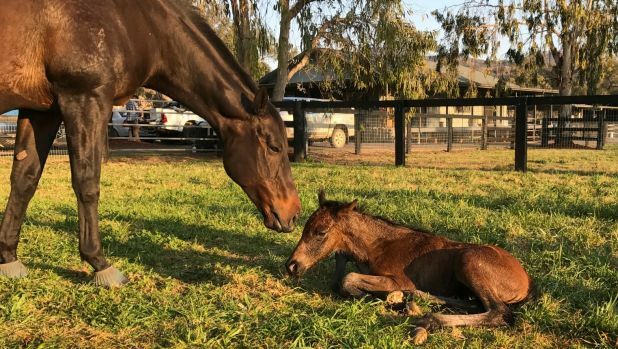 Who will Black Caviar be bred to for her 2018 foal? I had heard talk that it was going to be American Pharoah. Private Thoughts wrote: Who will Black Caviar be bred to for her 2018 foal? I had heard talk that it was going to be American Pharoah. They said when she foaled this year they weren't sure if they were going to breed her back for a 2018 foal. Either way, they will probably keep quiet about it. So many people have bitched and cried every time she is bred. PETA also did an article about how terrible her owners are for breeding her. After that article the owners came out with their own article about how BC likes being a mom and they would only treat the mare right. Anyway since then, I think they stopped announcing who she was going to be bred to. The More Than Ready breeding wasn't announced until December when she was confirmed in foal. I guess if they bred her we will find out if there is a press release that she is in foal. Has anyone seen any photos of the American Pharoah X Spain colt? I'd do nearly anything to see them. colt - To Honor and Serve out of Bird of Paradise (Summer Bird) Born January 28,2017 - Dam's mother is a half sister to champion, Wise Dan, and Successful Dan. filly - Wicked Strong out of Hallie Gay (Summer Bird) Born February 09,2017 - Half sister to unraced Moments to Saver. Dam is out of Stakes winner Jostle, and dam is a half sister to Adirondack King. Filly was reported to be exported after the Keeneland January sales. filly - Overanalyze out of Kissy Suzuki (Summer Bird) Born May 03,2017 - Dam is a half sister to stakes winner Perfectly Candid. Dam is also related to stakes winner Itsmyluckyday, Celtic Chant and more. filly - Congrats out of Abbeville (Summer Bird) Born April 03,2017 - Dam's mother is stakes winner Amelia, who also produced Assateague, He's Had Enough, Kindergarten Kid, Rainha da Bateria and Rabbit Run. filly - Capo Bastone out of Chickwithattitude (Summer Bird) Born March 04,2017 - Dam's mother is a half sister to stakes winner and champion sire, Tough Speed and also half sister to Asyouwish. colt - Union Rags out of Conquest Summerfun (Summer Bird) Born April 26,2017 - Dam's mother is stakes winner, Seasons Flair. Dam is also a half sister to stakes winner, Super Fuse and stakes placed Richierichierich and Barreling Home. colt - Lemon Drop Kid out of Danessa Deluxe (Summer Bird) Born March 06, 2017 - Dam is graded stakes placed, and also a half sister to stakes winner, Bellesofthebeach. Dam is also a FULL sister to Dreamin of Summer. Dam's mother is out of stakes winner, Belle Artiste. filly - Tapizar out of Dreamin of Summer (Summer Bird) Born March 06, 2017 - Dam is a FULL sister to Danessa Deluxe and also a half sister to stakes winner, Belleofthebeach. Dam's mother is out of stakes winner, Belle Artiste. colt - Carpe Diem out of Summer Chant (Summer Bird) Born February 20,2017 - Dam is a half sister to stakes winner Medolina. filly - Attila’s Storm out of Limeade (Summer Bird) Born April 03,2017 - Dam is stakes placed, and the dam is a half sister to stakes winner, Speed Gun. filly - Mr Speaker out of Bossy Bird (Summer Bird) Born March 08,2017 - Dam is a half sister to Boss Man (stakes winner over hurdles). colt - Guilt Trip out of Promise Me G (Summer Bird) Born April 28,2017 - Dam is a half sister to stakes winner, Class Above. Dam is also related to multiple stakes winner, Promise Me Silver. filly - Distorted Humor out of Heavenly Summer (Summer Bird) Born March 12,2017 - Dam is a half sister to stakes winner, Heavens Runway. Dam is also related to stakes winner Nite Dreamer. colt - Street Boss out of Appealing Katie (Summer Bird) Born April 21,2017 - Dam's mother is stakes winner, Regally Appealing and a half sister to stakes winner, Makakvi. Regally Appealing is a half sister to Regal Miss Copelan (dam of Rockport Harbor and also dam of Bird of Fire (Summer Bird)). colt - Kodiac out of Summer Blues (Summer Bird) Born April 1st, 2017 - Dam is out of champion, Dispute.